Degree One Events: HIEROGLYPHICS w/ BLUE SCHOLARS. You all know the chant and just how super sick HIERO shows are. Well, they are back... West Coast Hip Hop Legends THE MIGHTY HIEROGLYPHICS touch down in Victoria for another crazy show Sunday, Sept. 28th. 919 Douglas Street, Victoria, B.C. Tickets are IN STORES NOW and flying out the doors.... get yours asap... don't run the risk of being left out in the cold beacause you know THIS SHOW WILL SELL OUT. Rooted in the creative atmosphere of the Bay Area, Hieroglyphics has emerged as a powerful force within underground hip-hop culture. This crew is one of the first to successfully forge careers as a collective and as individual artists. Sales for the crew have sailed well beyond 3 million units— and that’s not even including their various tapes and underground records released in the early days. If you felt the Hieroglyphics camp for the first time when Del the Funky Homosapien emerged on the scene in ‘91 with the classic, I Wish My Brother George Was Here, you had to know that great things were ahead. In 1998, armed with experience and insight, Hieroglyphics formed their own independent company, Hiero Imperium, and soon released their first album as a collective unit, Third Eye Vision, followed by releases by each of the individual artists on the label. Hieroglyphics also built a strong online presence through their award-winning website - hieroglyphics.com (10 years and running !) and merchandise line prominently featuring their famous three-eyed logo. The success of the Hieroglyphics Imperium label has enabled them to branch out beyond their own work to expand their musical legacy. In '02 Hieroglyphics released one of Hip-Hop’s first CD/DVD hybrids, One Big Trip, which included a soundtrack on one side of the disc and a movie on the other. Artists within the collective also have collaborated with the likes of Dilated Peoples, George Clinton, Jurassic 5, Gorillaz and Dan the Automator.2003 brought about the formation of a brand-new wing of the Hiero Imperium, Hiero2, which showcases the next wave of innovative independent artists. Releases include projects with soul singer Goapele, and hip-hop artists Z-Man and Encore. 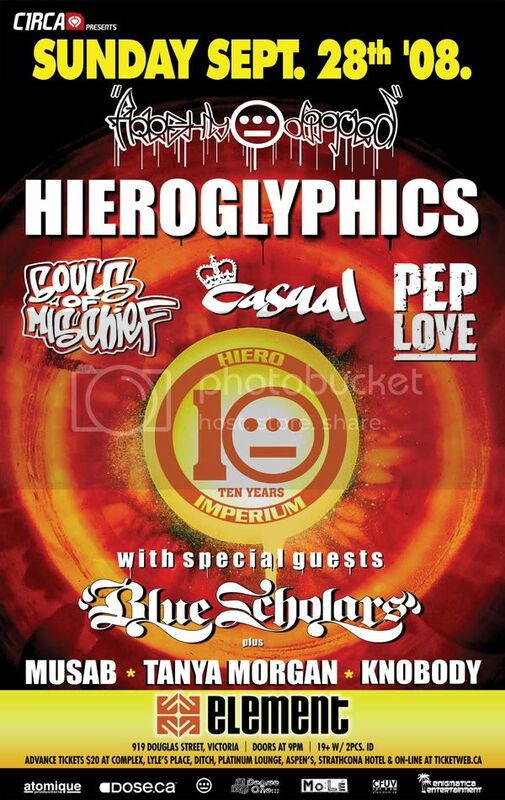 The Hieroglyphics crew followed up Third Eye Vision with a release entitled Full Circle, as well as solo albums from Tajai (Power Movement), Casual (Smash Rockwell), Pep Love (Reconstruction) and Del the Funky Homosapien (Eleventh Hour). These Hip Hop Legends are out on a massive world tour... 'The Freshly Dipped Tour' is coming to Victoria... DO NOT MISS IT ! !